Although the number of family-owned businesses that survive into a third-generation hovers around only 10 percent, Cyle Newton, managing director of Newton Oil and a 2017 graduate of Krannert’s Weekend MBA program, is helping his company buck the odds. The petroleum supplier was founded by his grandfather, Cliff Newton, in 1976 in Lafayette, Indiana, and is currently owned by Cyle’s father, Chuck, and his uncle, Jim. Over the years, the company has expanded the services it provides to farming, transportation, manufacturing, services, grain operations and racing fuel, supplying customers across the Midwest and beyond. Although Cyle worked for the family business during summers while he was growing up, the father of five and U.S. Marine Corps veteran first earned his chops in the energy industry with supervisory and technical roles at Vestas American Wind Technology and BP Alternative Energy. Cyle officially joined the family business in 2013 as director of transportation and safety, but knew he needed more management skills to help bring the company into future generations. After considering his options for part-time MBA programs that went beyond a purely online format, he discovered one of the best was in his own backyard. Still, earning an MBA as an employee of a small, family-owned business required a different approach than that taken by students who worked for larger corporations. The diversity of the program was another positive, he adds. 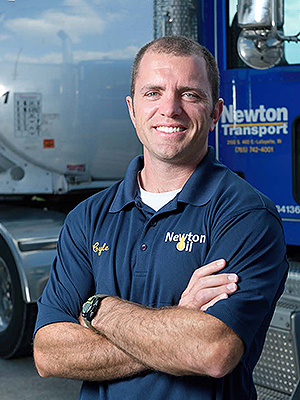 Cyle began applying his new skills even before he completed his degree in May, helping to expand Newton Oil’s fleet of drivers and introduce a new brand of premium diesel fuel. In his current role as managing director, he collaborates with his father and uncle to create budgets for six divisions of the company, helping reduce expenses and increase profit. He also has launched improvement initiatives to streamline ordering and delivery, negotiated index-based and futures fuel contracts, and created a more cohesive organizational and operational structure.